Earlier this month MSI's marketing department send out evidence that Gigabyte's motherboards don't truly support PCI Express 3.0, but now Gigabyte defends itself with a presentation of its own. You can check it out at TPU. 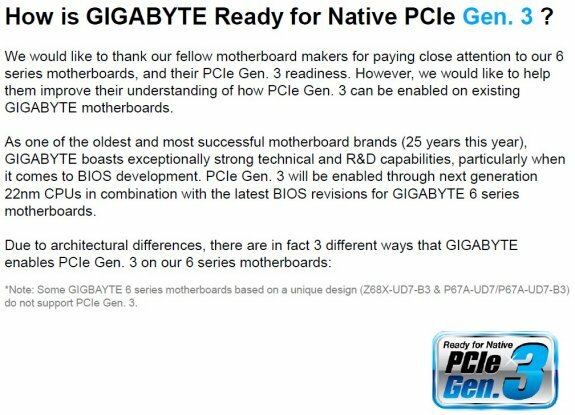 In its short presentation with no more than 5 slides, Gigabyte tried to provide an explanation to its claim that most of its new motherboards are Gen 3-ready. The presentation begins with a diplomatic-sounding message on what is the agenda of the presentation, followed by a disclaimer that three of its recently-launched boards, Z68X-UD7-B3 & P67A-UD7/P67A-UD7-B3, lack Gen 3 readiness. This could be because those boards make use of a Gen 2 NVIDIA nForce 200 bridge chip, even the first PCI-E x16 slot is wired to that chip..